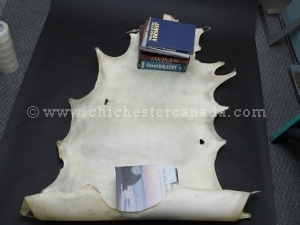 Our white tail deer rawhide is of good quality. The hides are sorted based on the number, size, and placement of the holes on the hides. 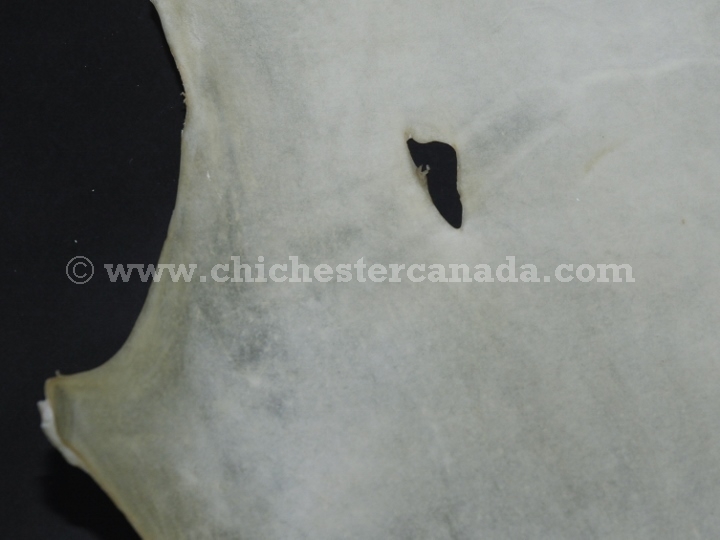 For example, a Select hide will have only small holes along the sides of the hide but none in the middle of the hide, a #1 hide will have a few small holes near the sides and towards the middle of the hide, a #2 hide will have more holes than a #1, and a #3 hide will have many larger holes throughout the entire hide. These are sold by the hide. 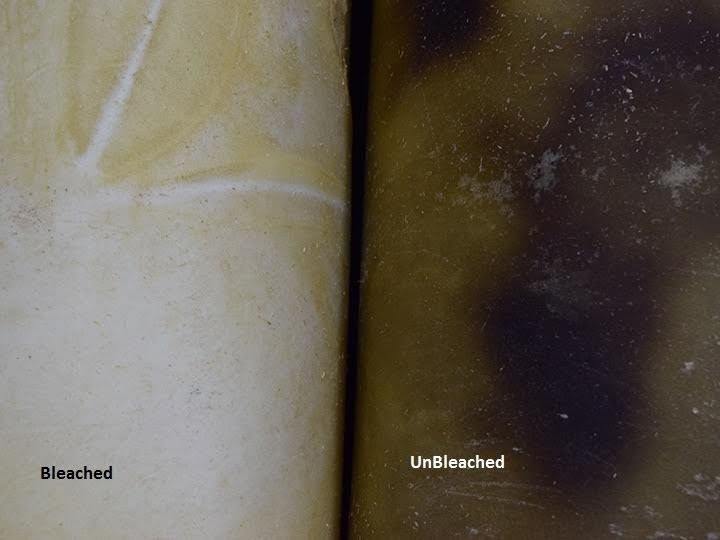 The bleached rawhide is prepared in a light parchment color (i.e., like pale honey) using a hydrogen peroxide treatment. 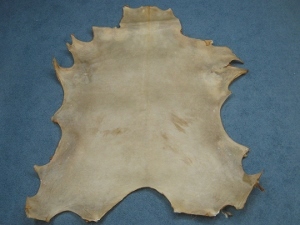 The natural rawhide is unbleached and has a darker brown tint. Its sound and strength is the same as the bleached, and it is more malleable than the bleached rawhide when wet. The rawhides range in size from 2.5 sq. ft. to 7.5 sq. ft. One select white tail deer rawhide measured 56" long, 28.5" wide across the top, 28" wide across the middle, 35" wide across the bottom, and weighed 1 kg. 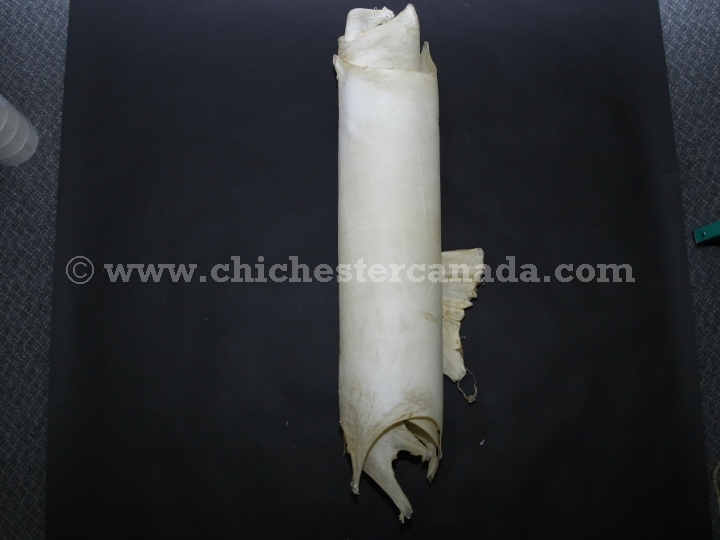 Rawhide is also referred to as parchment or vellum. Our red deer rawhide are first-grade and come from ranch-raised red deer so they are clean without bullet holes. These average 18 to 20 sq. ft., bigger than wild red deer, which average about 15 sq. 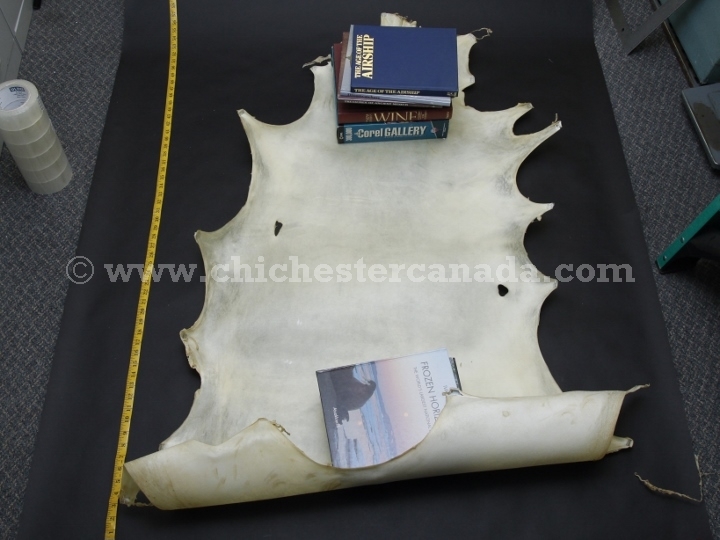 ft. One red deer rawhide is measured to be 64.25" long, 45" wide at the top, 42.50" wide at the middle, and 52" wide at the bottom. It weighed 2 kg. Genus and species of white tail deer: Odocoileus virginianus. Wild. Genus and species of red deer: Cervus elaphus. Ranch. White tail and red deer are not endangered and are not subject to CITES controls.